Trapping your cash once again. 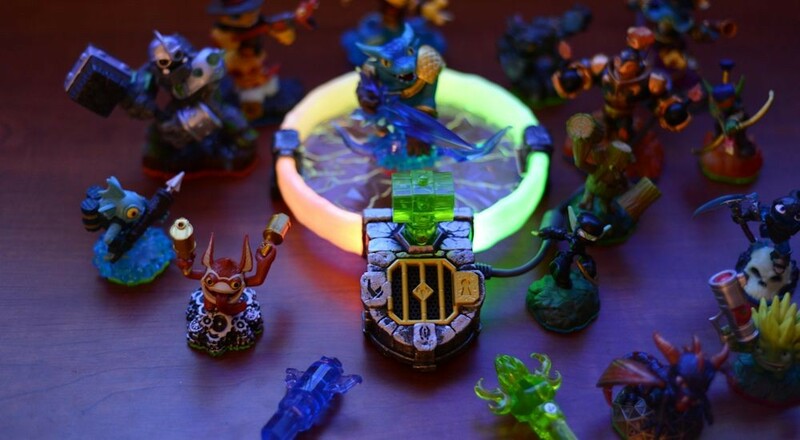 Skylanders might have been marketed as a game for kids, but the addicting "gotta collect them all element" combined with fun and inventive gameplay have made it a staple in both adults and children’s gaming diet. We’re now on the fourth Skylanders game in the series, with the latest being called Skylanders Trap Team. This time it’s all about the villains, or at least, capturing them. Once again you’ll be required to purchase a new portal to play the game, but thankfully, all of your existing Skylanders are still completely compatible. That said, still expect to shell out plenty of money if you want to get the entire Trap Team experience. This time you’ll be buying new "Trap Team" Skylanders and Elemental Gems to trap those villains in. There’s also new versions of classic Skylanders you can purchase. 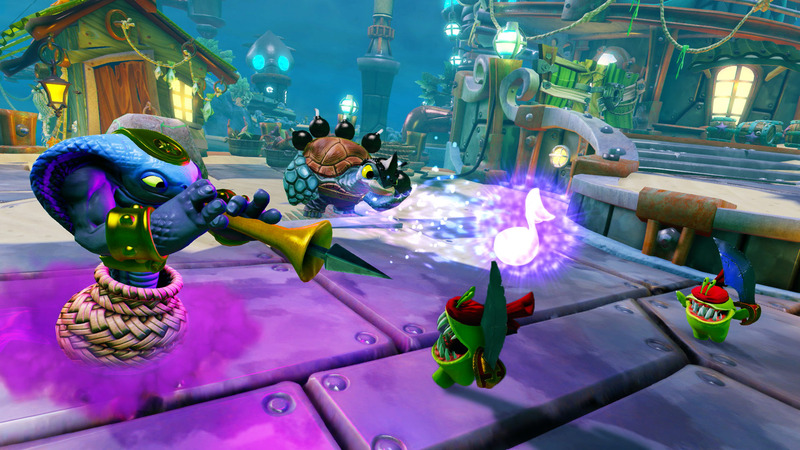 Skylanders Trap Team adds a focus on the villains within the game. By putting special crystals in the new portal, players can trap several enemies (that matches the crystal’s element) from within the game to swap to at any time. This isn’t limited to just the major bosses, but dozens of enemies found within the levels themselves. Trapping an enemy will light up your kid’s eyes in amazement as the sound magically travels from the TV to the little portal (yay doppler effect) and lights up the crystal. You’ll hear the bad guy talk about being stuck in his new found prison and how he’s ready to repent his sins and work for the good guys. It’s pretty damn cute, and the random bouts of dialog during combat that come from your currently trapped enemy can be entertaining. In terms of co-op play, the villains become a third character that either of the two players can switch into at any time. This works out well when you’re low on health, but further more, some of the characters have great co-op support abilities like healing, crowd control or Chill Bill’s freeze gun to stun enemies for your partner. 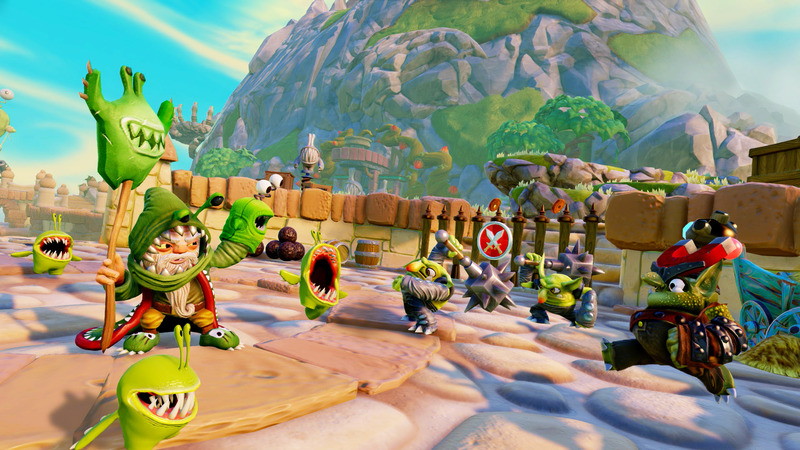 As we said in our E3 preview of the game, Skylanders Trap Team looks to have some of the most inventive characters to date. My personal favorite Broccoli Guy is a force to be reckoned with and great on co-op support, but there are other wild and random enemies like a giant puking pinata, a sheep with dual rocket launchers on its back and 50 foot slug that has an addiction to soda. On the disappointing side are the new Trap Team Skylanders themselves, who only seem to be around to break magical crystals located in specific areas of the game to halt progression. They just aren’t as interesting as the Giants were when they were introduced, or as versatile as the Swap Force characters from the previous game. The other problem with the characters in Skylanders Trap Team is that the progression system feels really amped up, and maxing out your character takes no time at all. This can happen for a few reasons. One of the changes in the game is all loot is shared; meaning all treasure pickups found within the game are earned by both players in co-op. The second is a side effect of a new game mode called Kaos’s Doom Challenge. This survival mode mixes tower defense with wave gameplay across ten maps. It’s quite a lot of fun, though it’s a little easy. Each of the ten maps have you starting up towers with Skylanders of the appropriate element and then taking on up to 10 waves of enemies while protecting a chest which houses a giant boss. Survive the waves, get treasure from the chest. Let the enemies break the chest? You’ll need to conquer the boss. But the problem is, the rate at which you earn gold and bonuses is incredibly rapid; every wave you’ll be collecting gold and XP. I took a level one character all the way to fourteen in just five missions - which took about an hour of play. Yup, you can basically grind your Skylanders up levels so you can own the town. Page created in 0.3936 seconds.